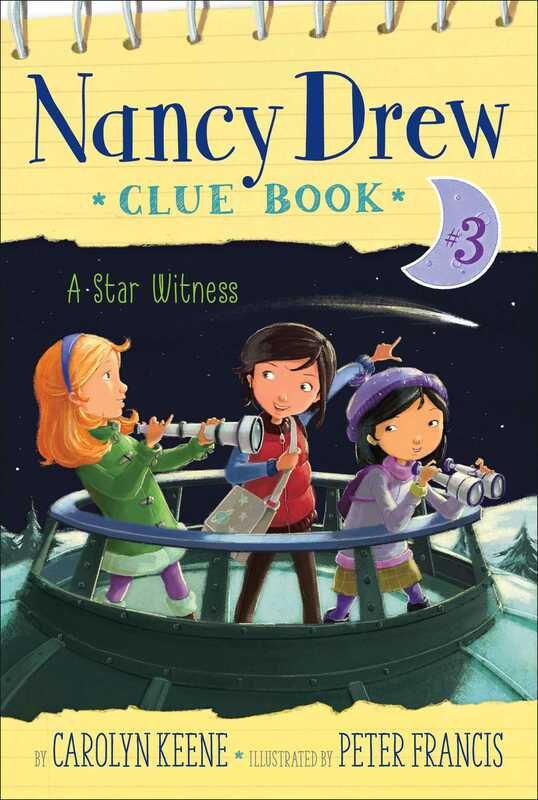 When a famous telescope goes missing at the planetarium, Nancy and her friends must zoom in on the culprit in the third book in an all-new, interactive Nancy Drew chapter book mystery series. Includes space for readers to jot down their own ideas and solutions to the case! As the newest member of the River Heights Astronomy Club, George brings Nancy and Bess on a special field trip to the city’s high-tech planetarium. There they meet famous astronomer Dr. Winston Arnot, learn about the planets and the stars, and even get to see an awesome planetarium show. After dinner, they’re supposed to meet on the museum’s roof to gaze at the night sky using the Starship 5000, one of the world’s most powerful telescopes. But when they arrive they discover the famous telescope has been stolen! Can Nancy and her friends solve the case before Dr. Arnot becomes the main suspect? “That’s it! That’s them!” George Fayne cried as Mr. Drew pulled up outside the planetarium. She pointed out the car window. A group of people of all different ages was standing near the entrance. A woman with glasses and frizzy red hair held up a green flag with the letters RHAC written on it. “That’s the River Heights Astronomy Club?” Nancy Drew asked, looking at the group in front of them. There was a woman wearing a turtleneck (even though it was eighty degrees out), standing with a little girl a few years younger than Nancy, and a couple with white hair. It wasn’t quite what she’d expected. “Right after we see the Starship 5000!” George said. “What’s the Starship 5000?” Bess whispered to Nancy. Nancy just shrugged. George and Bess were cousins, but they couldn’t have been more different. George loved adventure. She went hiking on the weekends, was part of their town’s astronomy club and their school’s chess club, and was the first of their friends to try judo. She wore her brown hair short and only went to the mall when her mom made her go back-to-school shopping—or to buy another electronic gadget to add to her collection. Her cousin Bess liked spending nights curled up on the couch, watching old movies. She had wavy blond hair that went past her shoulders and had the perfect outfit for every occasion—whether it was a school dance or the state fair. “How many meetings have you been to so far?” Bess asked as they walked toward the group. Nancy looked up at the giant white building in front of them. There was a dome on one side—that was where they held all the different space shows. She’d passed it so many times, but hadn’t been inside since she was in first grade either. Now that George had joined the River Heights Astronomy Club, they finally had a reason to go back. George had been talking about the big trip for over two weeks now. The club was going to explore the museum and see a special show by a famous astronomer, Dr. Arnot, in the dome. George had invited Bess and Nancy along as her special guests. “Something like that,” Nancy said. She glanced sideways at George and smiled. Nancy, Bess, and George had a club called the Clue Crew. They’d become good at helping people in River Heights figure out things they couldn’t on their own. Sometimes someone’s cell phone disappeared. Other times the Clue Crew found lost dogs. One time they’d helped Nancy’s neighbor after her prize-winning roses were stolen. Nancy even had a special Clue Book she used to write down important details and suspects. “George! You’re here!” the little girl, Trina, called out. She ran over to George and gave her a big hug. She was dressed in black boots and a little green hat with a bow on it, and carried around a tiny pair of binoculars. Trina’s mom smiled as George picked Trina up and spun her around. She waved the green flag in the air as she turned inside. There were only seven astronomy club members besides Lois, so the flag didn’t seem necessary, but Nancy followed along anyway. They stood there, staring up at the fifty-foot ceiling. It was painted a deep blue with tiny glittering white stars. “I think I see the Big Dipper!” Bess said, pointing to the constellation that looked like a cooking pot with a big handle. They followed Lois into a room that had one long glass wall. Floating in front of the wall were each of the eight planets. Some of the planets had been hollowed out and were big enough to walk around in. People were climbing the stairs and wandering inside them, reading different information about Saturn or Jupiter. Trina hovered next to her mom, pointing at each planet one by one. “My very easy method just speeds up names,” she said slowly. The group split apart, with Celia and Trina going straight for Jupiter. There was a window in the giant planet’s side, right where its great red spot is. Nancy and Bess followed George to Earth. They climbed the stairs that wrapped around the planet and went inside the back. There were even seats so they could sit down. A screen on one of the walls showed videos of people from all different countries. One woman was weaving a basket and another was carrying pineapples on her back. There were scenes of panda bears and strange colorful insects, followed by underwater scenes of sharks and dolphins. Marty and Hilda waited for the girls to catch up. The group was almost out of the Hall of Planets when they noticed an older man with wiry gray hair that stuck up in different directions. He wore a polka-dotted orange bow tie and had what looked like a mustard stain on his shirt collar. The man was standing in the hallway, talking loudly to a young woman who was wearing black-rimmed glasses and a red headband. She had on black Mary Jane shoes. Dr. Arnot turned around, looking confused. It was clear he didn’t remember. “So how long have you been working with Dr. Arnot?” Marty asked. “Cool,” Trina said. “So you want to be an astro . . . nomer?” She had trouble getting out the whole word. “Oh, we’d hate to keep you from your presentation!” Hilda said. “Have you seen the moon landing exhibit?” Kirsten asked. Kirsten waved for the group to follow her. They went down a side hallway that led to a smaller room. The floor was grayish white with fake craters all over it. The walls were painted black with glittering stars. On one wall you could see Earth. “It’s just like we’re on the moon,” Bess remarked. The rest of the group scattered. Some studied the text on the wall beside the rover, which described the first time a human landed on the moon in 1969. Nancy and her friends put on the astronaut helmets. There were even puffy astronaut jackets that were all white with different metallic pieces on them. The girls put those on too. “I can barely see out of this,” Bess said with a giggle. She almost fell back over the side of the moon rover, but George grabbed her hand, keeping her steady. Nancy climbed down off the rover, grabbing the flag that was there for a prop. She pretended to walk very slowly, like she was moving through water. She’d seen the footage of the first moon landing in science class. Buzz Aldrin had floated and bounced above the surface of the moon.